Prime Minister Sheikh Hasina left Dhaka this morning for Germany in her maiden overseas tour in the third consecutive term in office which would take her to the United Arab Emirates (UAE) as well during the return journey. 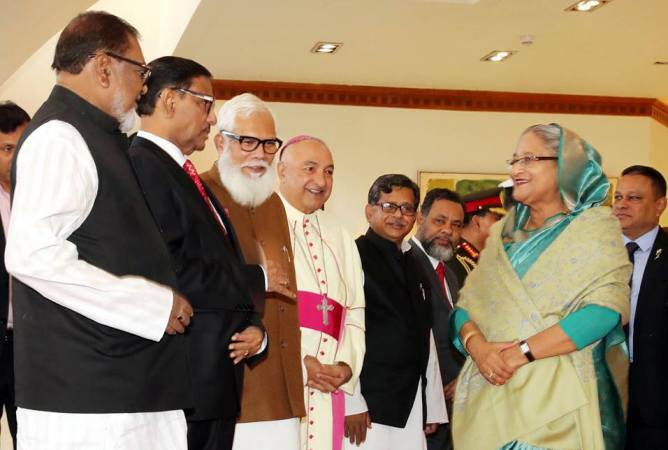 During the six-day two-nation tour Sheikh Hasina will join an international security conference in Germany’s Munich, and attend a defense exhibition in UAE’s Abu Dhabi where she would also hold bilateral talks with the leaders of Middle Eastern nation. A VVIP flight of Biman Bangladesh Airlines carrying the premier and her entourage members took off from Hazrat Shahjalal International Airport for Munich at 8:20 am. The flight is scheduled to reach Munich International Airport at 1.15 pm. Munich time. The two-day Munich Security Conference begins in Munich on February 14, where the premier has several other engagements including meetings with leading business conglomerates and health campaigners. Sheikh Hasina will visit Abu Dhabi from February 17 to 19 to attend the 14th International Defence Exhibition (IDEX-2019) and hold bilateral talks with the UAE leaders. Sheikh Hasina will have an audience with Sheikha Fatima bint Mubarak Al Ketbi, Wife of Late Sheikh Zayed bin Sultan Al Nahyan, the Founder and the Inaugural President of the UAE and Ruler of Abu Dhabi at Al Bahar Palace. The prime minister will join a community event to be held at St Regis Abu Dhabi Hotel where she will stay during the visit.